This is the GolfBC web site (the "Site"). GolfBC is committed to respecting the privacy of all visitors to the Site. As part of the operation of GolfBC.com, we gather personal data, such as names, mailing addresses, credit card information and email addresses, and would like to explain what we do with it. Personal data is collected when users provide it to GolfBC.com by booking a teetime, signing up for eNews, by purchasing items from us and in registering for contests and other promotional opportunities provided by GolfBC.com. We also collect personal data from GolfBC Rewards card sign-up forms and Customer Experience surveys (unless requested otherwise by checking the appropriate box on the form). In addition, we may collect the email addresses of users who contact us by email. We only collect such data as is necessary for the purpose identified. GolfBC.com uses the personal information we collect for multiple purposes. The information is used to notify users via GolfBC eNews about special offers, promotions, contests, updates to the site, changes to the GolfBC Rewards program or opportunities that we believe will be of interest to you. The information may also be used to customize the content and/or layout of the site for each individual user. If you would prefer not to receive communication from GolfBC, please choose the "opt-out" option in our eNews or reply to our email with "usubscribe" in the subject of your reply. GolfBC takes care to ensure your personal information is securely stored and held in confidence by GolfBC. To enable us to more efficiently provide our products and services, we may send out communication on behalf of various third parties and/or GolfBC partners. Our current corporate policy does not include the transfer of personal information to third parties. Upon receiving your written request, delivered to our Privacy Officer at [email protected], we will tell you what information we hold about you and provide it to you within 30 days of receipt. We will advise you of any charges for copies of your information. GolfBC.com also uses "cookies" to collect information. A cookie is a small data file that most major web sites write to your hard drive for record keeping purposes when you visit them. Cookies allow GolfBC.com to measure activity on the site and to improve your user experience, for example by remembering your viewing preferences. Cookies are used by GolfBC.com to measure activity on the site and to make improvements and updates based on which areas are popular and which are not. Cookies are not used to target promotional information to users. 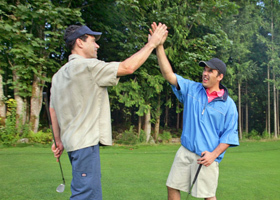 GolfBC.com encourages parents and guardians to spend time with their children online, and to be fully familiar with the sites visited by their children. No information should be submitted to the site by users under the age of 13 years without the consent of their parent or guardian. GolfBC.com does not provide any personally identifying information for users under the age of 13, regardless of its source, to any third party for any purpose whatsoever unless disclosed during collection. Users under the age of 13 are generally asked not to participate in contests or other promotional opportunities. GolfBC.com requests that children under the age of 18 do not submit information to the site without a parent or guardian's consent. GolfBC.com may collect information, including personally identifying information, from users between the ages of 13 and 17, and with the permission of their parent or guardian this information may be used for marketing and promotional purposes by GolfBC.com and may be shared with third parties. If a user or their parent or guardian changes their mind with respect to such use, such user, parent or guardian may stop that use by e-mail request. It is important to note that GolfBC.com contains links to sites other than GolfBC.com, and that those sites may not follow the same privacy policies as GolfBC.com. This can include links from advertisers, content providers and partners who may use GolfBC.com's logo and or style as a result of a co-branding agreement. These sites may send their own cookies to you, and may collect data and make uses of it that GolfBC.com would not. GolfBC has no control over these linked sites and has no responsibility or liabilities for their actions. GolfBC is not responsible for the privacy practices or the content of such sites. By using this site, you consent to the collection and use of personal data by GolfBC. GolfBC.com reserves the right to change this policy at any time.